Today, when we go to purchase an electrical appliance for our house, the number of choices available exceeds our capacity to understand and evaluate them. We are heavily loaded with information on a large number of products. This may at times land us in purchasing something that might not be the best option for us. However, once purchased, they are going to stay in our house almost till the life of the appliance, say 8-10 years for expensive appliances like refrigerators, air conditioners or washing machines.Hence, it makes a lot of sense to understand the services that we want to derive from the appliance and our expectations from its performance. Depending on whether we are purchasing it for the first time or upgrading/replacing an existing item, various determinants such as cost, size, design, features, color etc. appear at different positions in our priority list. An important factor that must be understood is how much electricity that the appliance will consume once it is purchased. An understanding of how much extra money we may need to pay for an appliance that consumes less energy will prove useful in the long run. Research has proven that our purchase decisions are largely driven by the cost of owning the appliance (paid at the time of purchase) and we tend to overlook the cost of using the appliance (paid in installments in the electricity bill). Research has also shown that once we are informed about the future benefits, we take more rational decision. In order to provide us with this information, Government of India (Bureau of Energy Efficiency, Ministry of Power) introduced the Standards and Labelling Program in May 2006. 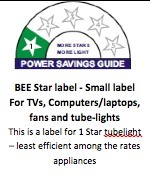 Under this program the manufacturers are required to place a label showing how much electricity the appliance will consumer under certain conditions. The program is currently running for refrigerators, air conditioners, televisions, geysers, tubelights and fans among the household appliances. The scheme is mandatory for some of the appliances while voluntary for others. However, once we have decided to save electricity and reduce our bills, it becomes mandatory for us to look at wherever these labels are what they tell. The details of these labels are explained by BEE on various documents available on its website. For each of the appliance we have tried to explain various items on the labels. If you do not wish to spend much time thinking about ‘how much’ efficient it is and you do not mind paying for the most efficient one, you can simply go for the five rated appliance. An additional aspect that you must know about the labelling program is that it is getting updated every year. Some of you must have wondered that as the technology improves and more and more efficient products are made available, how the labels will adjust. For example, if a company manufactures an appliance in 2012 which is more efficient than a five star rated appliance in 2011. 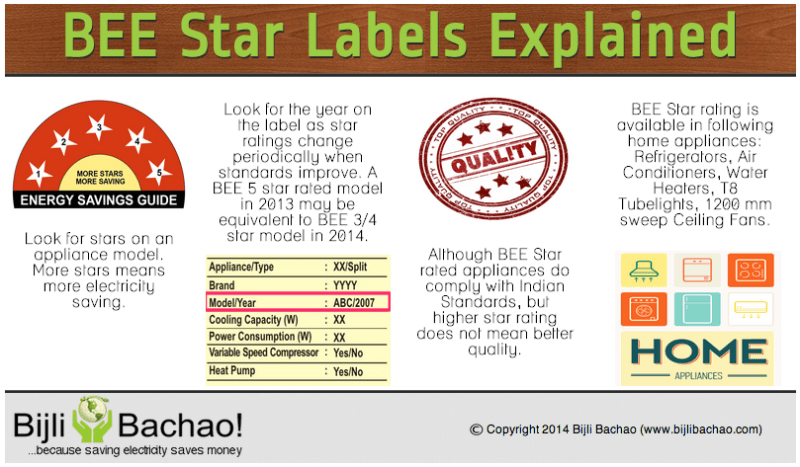 How will the label show the difference between a five star rated appliance in 2011 and the new most efficient appliance in 2012? The star rating plan is different for products manufactured/imported or assembled in different years. Among all appliances, the easiest to comprehend are the labels for refrigerators as they provide the expected annual consumption in kWh. This can be simply multiplied by the average cost of electricity to arrive at the approximated cost of using refrigerator in your house. The stars on refrigerators depend not only on the energy used but also on the volume of the refrigerator. 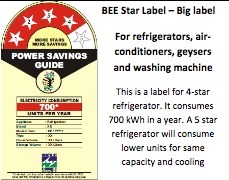 A formula using annual energy use, constant multiplier, adjusted storage volume and constant fixed allowance is used to calculate the star rating for a particular refrigerator. A refrigerator of gross volume 250 Liters manufactured in the year 2010 consuming 385 units is rated five stars. A refrigerator of the same volume manufactured in the year 2012 consuming same units is rated four stars. This is so, because in 2010 the refrigerator was among the ones consuming least energy. With technology innovation, there are refrigerators manufactured in 2012 consuming less than the best in 2010. It is always advisable to look for the manufacturing year and the year for applicability of the label before doing a comparison between two refrigerators. There is a green box in the label that shows the year for which the label is applicable. The same hold true for air conditioners. However, for other appliances, similar update has not been done so far. If you wish to see more details and do some analysis as to how much extra you will be paying now and what benefits you will get in future, please keep watching Bijli Bachao (you can do so by liking our facebook page http://www.facebook.com/BijliBachao).